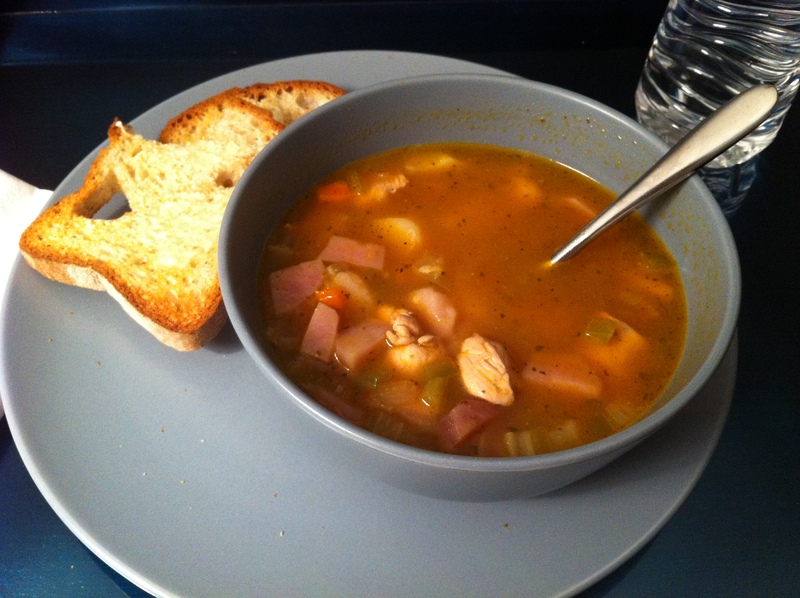 The Grim, Hypoallergenic Soup, and an Allergy Attack! For those of you out there with severe allergies, there is no worse feeling in the world then that moment your throat begins to close and you realize you’ve eaten or been exposed to something on your severe allergy list. It happened to me yesterday. A sweet and every well-meaning co-worker had made gluten-free, corn-free chocolate chip cookies. They were delicious. But I’d eaten almost the whole cookie when I heard her tell another co-worker that she’d used applesauce in place of sugar. I immediately threw away the rest of the cookie, but the damage had been done. I’m very allergic to apples, so I popped a half of a Benadryl®. But twenty minutes later, my throat and tongue started to swell and I could feel my face getting bigger. Another half a Benadryl® and another twenty minutes later, and I had to go home and take another (I don’t drive if I have to take more than one, so I went home before I took #2). As I turned down my street (which faces a large park) I saw a huge black dog all alone in the park under some trees. 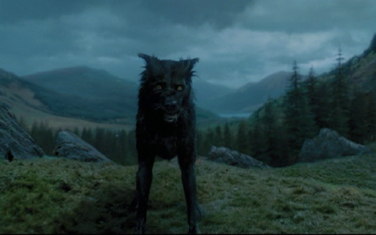 At that point, I had enough medicine actively working in me that, combined with the fact that I had just re-read Harry Potter and the Prisoner of Azkaban over the weekend, my first thought was, “OMG! It’s a Grim! I’m going to die.” Yes, I know: nerd alert! Luckily, my mom was able to meet me there to make sure I didn’t need to go to the hospital. And clearly, the black shaggy dog did not mean my demise was imminent since I’m writing this to you now. The second full Benadryl® did the trick, but I was essentially passed out until this morning, when I groggily got up and made my way out to vote and go to work. But I know I’ll be taking a half a Benadryl® morning and night for the next week to three weeks as the hives continue and my body slowly, but surely recovers. Bummer, huh? But the whole thing got me thinking about what would have happened if I didn’t find out about the apples right away and had gotten really sick at work. The “Grim” I saw may have been a little more terrifying then! So I thought I should share my reaction plan with y’all and see if you have any other tips or tricks for dealing with a bad reaction. As soon as I start feeling a reaction, I tell someone–preferably more than just one person. I also show them my EpiPen® and explain how it works if they don’t already know. (Multiple family members, friends, and co-workers have had this demonstration and know the drill already). If I’m alone, I call everyone I can think of within driving distance until someone agrees to come over and watch me. I take a half a Benadryl® and give it 20 minutes to kick in. If I’m still feeling it after 20 minutes, I take another half. If, after 40 minutes and a whole pill, I’m still feeling it, I get myself to somewhere I can sleep and take another pill. If within 20 minutes of taking the second Benadryl®, I am still feeling reactive (and not just sleepy from the medicine), I immediately go to the ER and get treatment. Once I have the most immediate symptoms of the reaction under control, I generally sleep for the next 12-15 hours. I do ask that my husband wake me to make sure I get lots of fluids and eat something super-safe. I’ve found that drinking plenty of water helps reduce symptoms and helps my body recover more quickly. I stick to very safe foods (like the recipe below) for the next few weeks, knowing my body will be more reactive than usual until it recovers from the bad attack. This means no eating out and making sure I prepare everything I eat myself if at all possible. I usually have hives for several weeks after an attack, so I pop a half a Benadryl® morning and evening to help control the uncomfortable itching. I also try to get extra sleep and rest. What about you? Do you do anything differently after an attack? I’d love any tips for a speedier recovery! Sauté onion and celery in olive oil until slightly translucent. Add chicken, potatoes, broth, and seasoning. Bring to a boil. Simmer soup for 15-20 minutes. Voila! Easy, delicious, and safe. Perfect for recuperating with a good book, like Harry Potter and the Prisoner of Azkaban, just don’t let your imagination run away with you like mine did! This entry was posted in Allergy, gluten-free, Healthy, recipes and tagged allergic reaction, benadryl, epipen, grim, Harry Potter, hypoallergenic, recipe, soup, tips by mollykhodgin. Bookmark the permalink. Haha, this post made me laugh. Benadryl can make you delirious! I try to teach people close to me how to use the Epi-pen when I’m feeling perfectly fine, just in case. I’ve luckily never had to use it, but I have had some pretty severe reaction (including respiratory arrest, where I had to be intubated). I usually am extremely nervous eating baked goods that other people made! I’ve never had to use mine either, though I’ve come close a few times. Luckily, I’ve always lived quite close to good hospitals. And yeah, I’m usually pretty nervous about eating anything someone else makes, but I know she had the best of intentions! Ahh, oh well!